The Long Island Index offers a variety of interactive maps that can answer these questions and more! The Long Island Index has launched a new set of interactive maps that enables Long Islanders to access easily an extraordinary array of data about our region and its communities. The map provides a wealth of information about the region, its characteristics, and key indicators – as well as its individual communities and their attributes. Maps of Long Island’s Special Districts and Multifamily Housing have also been integrated into these new maps rather than being a standalone system. 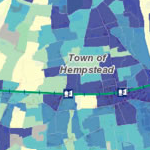 New interactive maps showing 40 years of demographic transformation across Long Island. A birds-eye view of demographic change on LI from 2000-2010, down to the smallest level that the census is able to provide data.